Pernambuco wood was harvested from trees growing on the east coast of the Portuguese colony of Brazil, and due to the wood's use as a dye in the creation of textiles the harvest of pernambuco became a focus of colonial industry and trade. To derive a dye made from pernambuco, the wood was broken down into a very fine sawdust which was then soaked in water, resulting in vivid fabric colors from orange to purple. In Portuguese "pau-brasil" means "furnace-red wood," named for the wood's deep red color, and the colony took its name (Brazil) from the name of one of its most profitable exports. Although not as infamous as sugar cane or tobacco harvesting, the extraction of pernambuco wood during the colonial period was just as intense and destructive as the more well known colonial cash crops. The extraction of pernambuco wood from the east coast of Brazil took place primarily from the 1500's to the 1800's, and was the determining factor in the creation of settlements, population centers, and systems of harvest and trade aimed at exporting the wood back to Europe to be used as a dye. The use of cheap and coerced indigenous labor, and later African slaves obtained through the transatlantic slave trade, allowed for a massive system of extraction that completely depopulated the region of pernambuco wood, enriching many Europeans in the process. 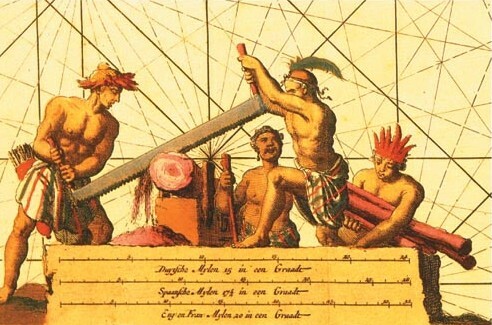 The frantic and brutal rate at which pernambuco wood was extracted also contributed to the genocide of indigenous nations inhabiting the land on which pernambuco wood was found, replicating a scenario all too common during the colonial period, where the death of indigenous peoples contributed to the enrichment of Europeans halfway across the world. The trade was so profitable that pirates and corsairs working for the French, English, Dutch, and other European powers would raid Portuguese ships and attempt to smuggle the wood back to Europe. In Paris in the late 18th century, a massive 168 acres of land were piled high with pernambuco logs extracted from Brazil. It was this influx of pernambuco wood to Europe that gave rise to the pernambuco wood bows used by violinists, violists, cellists all over the world. Legend has it that definitive French bow-maker Francois Xavier Tourte, the father of the modern bow, would visit the wharves where he would scrounge up different kinds of wood from the "New World" used in packing crates and barrels. Pernambuco proved to be exactly what Tourte was looking for: naturally springy, dense and strong, and readily adopting a curve that seemingly could hold forever. Unfortunately, pernambuco wood was often thorny or twisted, and one 19th century expert estimated that one could go through eight to ten tons of pernambuco wood in order to find the perfect piece needed to craft a bow. Modern techniques have improved that ratio, but it remains a difficult task to find the perfect piece of pernambuco wood for a bow. 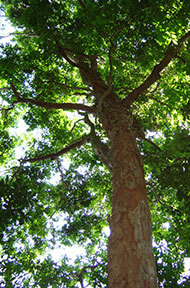 Only the best portions of the best pernambuco trees are suitable for crafting bows. The harvest of pernambuco during the colonial period was so intense that by the 18th century the industry started to collapse, and today the trees are nearly extinct in their original range. Pernambuco, which has the scientific name caesalpinia echinata, is listed as an endangered species by the International Union for the Conservation of Nature. Conservation initiatives have been undertaken with some success, but pernambuco trees are difficult to introduce into the wild and success has been limited. Bow-makers, whose livelihoods depend on the availability of pernambuco wood, are particularly interested in preserving the pernambuco that remains and planting new trees for the future. The International Pernambuco Conservation Initiative, formed by bow-makers, musicians, and music lovers, is dedicated to the preservation and perpetuation of pernambuco wood. Check out their site for more information on the efforts being undertaken to conserve and replenish pernambuco wood. Stay tuned for future blogs on the development of the modern bow! Dear Andrew, I live on the Island of Itamaracá, where , as I'm sure you know, was the first and main port for the exportation of "pau-brasil" at the very beginning of the 16th century. At the moment the whole area of the southern part of the island is threatened with destruction by mega development projects which a small, but rapidly expanding group are fighting tooth and nail. I would very much like your permission to translate and post this, your article, on mine and other Facebook pages. It may surprise you to know that the vast majority of brazilians, although aware of the use as dye of pau-brasil, are in complete ignorance as to it's use for bow-making. I have absolutely no interest in using the article for commercial purposes, my aim is to sensitize and inform the brazilians, with the aim of protecting the historic village and surrounding area from the advances of those only interested in speculation and profit. Hoping that this petition meets with your approval, thank you, Christopher Sellars.